Clinical History: A 39 year-old male patient complains of right thigh/pelvic pain and swelling, after being dragged along rocks while parasailing. (1a) Axial T1, (1b) coronal T1, (1c) axial STIR, and (1d) coronal STIR-weighted MRI images are provided. What are the findings? What is your diagnosis? (A) Axial T1, (B) coronal T1, (C) axial STIR, and (D) coronal STIR-weighted MRI images of the lower pelvis and thighs reveal a well-circumscribed subcutaneous area of low T1 signal and increased STIR signal (arrows), superficial to the (T) tensor fascia lata, (V) vastus lateralis and (R) rectus femoris muscles, containing a lobule of internal fat signal (arrowhead). 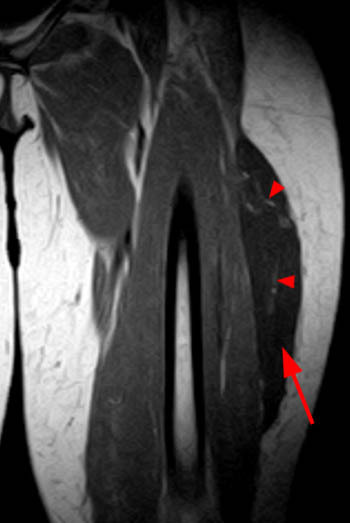 Incidental note is made of a small intramuscular lipoma in the left rectus femoris muscle (asterisk). A Morel-Lavallee lesion is a post-traumatic soft tissue degloving injury, originally described by French surgeon Victor Auguste Francois Morel-Lavallee in 1863.1,2 These lesions result from direct or tangential shearing forces that separate the skin and subcutaneous tissues from the underlying fascia. These shearing forces can disrupt perforating vessels and nerves, creating a potential space that fills with blood, lymph, debris, and fat (necrotic and/or viable). Closed degloving injuries are most commonly found adjacent to osseous protuberances, and have been described along the greater trochanter, flank, buttock, lumbar spine, scapula, and knee.1,3,4,5 They have also been described along the abdominal wall after liposuction.6 These lesions have been given multiple names, including Morel-Lavallee effusion, Morel-Lavallee hematoma, Morel-Lavallee extravasation, pseudolipoma, pseudocyst, ancient hematoma, organizing hematoma, chronic expanding hematoma, and post traumatic soft tissue cyst.2 When these injuries occur over the greater trochanter, they are known as Morel-Lavallee lesions, though some use the term Morel-Lavallee lesion to describe degloving type injuries regardless of location. Morel-Lavallee lesions are frequently identified within hours to days after the inciting trauma, but one-third of patients present months or years after the initial trauma.7 Morel-Lavallee lesions can be isolated, but they are frequently associated with underlying fractures. These lesions are most often unilateral, but bilateral lesions have been described.8,9 Patients complain of pain, swelling, and stiffness. On physical examination, patients often have a soft fluctuant area of contour deformity, with or without skin discoloration and skin hypermotility. Skin sensation is frequently decreased because of shearing injuries to the cutaneous nerves. Skin necrosis can occur acutely or in a delayed fashion. MRI is the imaging modality of choice in the evaluation of Morel-Lavallee lesions.2 Morel-Lavalee lesions are well defined oval, fusiform, or crescentic and may have tapering margins that fuse with adjacent fascial planes. Morel-Lavallee lesions may show fluid-fluid levels, septations, and variable internal signal intensity dependent on the concentration of hemolymphatic fluid and the acuity of the lesion. (Figures 3a,3b and 3c) Lesions may have no capsule, a partial capsule, or complete capsule. (Figures 4a and 4b) Capsules are hypointense on all pulse sequences related to fibrous tissue and/or blood-by-products.10 Lesions can have no enhancement, peripheral, septal, or internal enhancement. 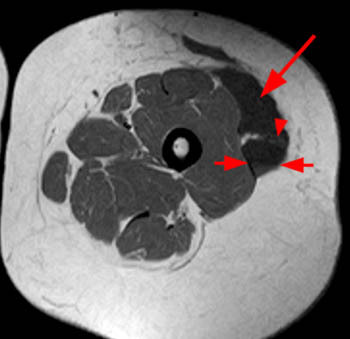 (3a) Axial T1, (3b) axial FSE T2, and (3c) coronal T1 MRI images of the left thigh in a 52 y/o female status post left thigh trauma, with pain and swelling. Images show a well defined crescentic fluid collection extending along the superficial fascia (arrow), a fluid-fluid level (short arrows), and central strands of internal fat signal intensity (arrowheads) consistent with a degloving injury. Vastus muscle strains (V) and mild subcutaneous edema are noted. (4a) Axial T1 and (4b) axial proton density fat-suppressed images of the right thigh in a 67 y/o female who sustained a fall 6 months prior to imaging. Images show an encapsulated (long arrows) subcutaneous fluid collection, with a fluid-fluid level (arrowhead), internal fatty septation and fatty nodule (short arrows). Mellado and Bencardino proposed an MRI classification system of Morel-Lavallee lesions based on lesion shape, signal and enhancement characteristics, and presence or absence of a capsule.2 Six types of lesions were described. Type I lesions were laminar shaped, seroma-like with decreased T1 and increased T2 signal. They occasionally had a capsule and did not enhance. Type II lesions were oval shaped and looked like a subacute hematoma with increased T1 and T2 signal. They had a thick capsule and variable enhancement. Type III lesions were also oval shaped and had the appearance of a chronic organizing hematoma with intermediate T1 and heterogeneous T2 signal. They also had a thick capsule and internal/peripheral enhancement. Type IV lesions were linear shaped and looked like a closed laceration with hypointense T1 signal and hyperintense T2 signal. These lesions had no capsule and variable enhancement. Type V lesions were described as pseudonodular with a round shape, variable T1 and T2 signal, a thin or thick capsule, and had internal/peripheral enhancement. Type VI were considered infected with variable T1 and T2 signal and had variable sinus tract formation, a thick capsule, and internal/peripheral enhancement. Conservative treatment with compression can be utilized for small acute lesions that have not developed a capsule.11 The presence of a capsule suggests that conservative or percutaneous treatment will be unsuccessful and the lesion will recur if not treated surgically.12 Tseng and Tornetta successfully managed lesions with early percutaneous drainage, debridement, irrigation and suction drainage.13 Percutaneous drainage and sclerodesis have been effective, utilizing agents such as talc and doxycycline.5 Some physicians perform open debridement with delayed closure or closure by secondary intention for all lesions, but others feel this can be reserved for those lesions that have a peripheral capsule or failed conservative treatment. Infection is a potential complication, necessitating the use of antibiotic therapy. Morel-Lavallee lesions are post-traumatic, closed, internal degloving injuries that most frequently occur in the subcutaneous tissues adjacent to the greater trochanter. MRI is the diagnostic imaging modality of choice in the evaluation of Morel-Lavallee lesions. The lesions are typically oval, fusiform, or crescentic, consistent with fluid dissecting along traumatized fascial planes. The MRI imaging characteristics of Morel-Lavallee lesions reflect the concentration of hemolymphatic fluid, the chronicity of the blood-by-products, the presence of fat (viable or necrotic), the presence or absence of a capsule, and varying degrees of enhancement. Morel-Lavallee lesions are frequently associated with underlying fractures, and are often identified within hours to days after the inciting trauma, but one-third of patients present months or years after the initial injury. When these lesions present in a delayed fashion, they can mimic a soft tissue tumor, but the location and shape of the lesion, conforming to that of the fascial plane is atypical for tumor. The typical location, morphology, signal characteristics, and enhancement pattern can help identify these lesions and guide appropriate therapy. The presence of a capsule is an important imaging finding that can be used to help select surgery over conservative therapy. 1 Morel-Lavallee VAF. [Decollements traumatiques de la peau et des couches sous-jacentes]. Arch Gen Med. 1863;1:20-38, 172-200, 300-32[in French]. 2 Mallado JM, Bencardino JT. Morel-Lavallee Lesion: Review with Emphasis on MR Imaging. Magn Reson Imaging Clin N Am. 2005; 13: 775-782. 3 Hak DJ, Olson SA, Matta JM. Diagnosis and management of closed internal degloving injuries associated with pelvic and acetabular fractures: the Morel-Lavallee lesion. J Trauma. 1997; 42: 1046-1051. 4 Parra JA, Fernandez MA, Encinas B, Rico M. Morel-Lavallee effusions in the thigh. Skeletal Radiology. 1997; 26:239-241. 5 Tejwani SG, Cohen SB, Bradley JP. Management of Morel-Lavallee Lesion of the Knee Twenty-Seven Cases in the National Football League. The American Journal of Sports Medicine. 2007; 35:1162-1167. 6 Scaranelo AM, Davanco RA. Pseudocyst formation after abdominal liposuction-extravasations of Morel-Lavallee on MR images. Br J Plastic Surgery. 2005; 58:849-851. 7 Hudson DA, Knottenbelt JD, Krige JE. Closed degloving injuries: results following conservative surgery. Plast Reconstr Surg. 1992;89:853-855. 8 Powers ML, Hatem SF, Sundaram M. Morel-Lavallee Lesion. [Online] Available http://www.orthosupersite.com/view.aspx?rid=21422, April 1, 2007. 9Hak DJ, Olson SA, Matta JM. Diagnosis and management of closed internal degloving injuries associated with pelvic and acetabular fractures: the Morel-Lavallee lesion. J Trauma. 1997;42:1046-1051. 10 Mellado JM, Del Palomar JP, Diaz L, Ramos A, Sauri A. Long Standing Morel-Lavallee Lesions of the Trochanteric Region and Proximal Thigh: MRI Features in Five Patients. AJR. 2004;182:1289-1294. 11 Harma A, Inan M, Ertem K. The Morel-Lavallee lesion: a conservative approach to closed degloving injuries. Acta Orthop Traumatol Turc. 2004;38(4):270-273. 12 Gilbert BC, Bui-Mansfield LT, Dejong S. MRI of a Morel-Lavallee Lesion. AJR. 2004;182:1347-1348. 13 Tseng S, Tornetta P. Percutaneous Management of Morel-Lavallee Lesions. JBJS. 2006;88:92-96.